Captain Costas was very lucky to born on the island of Hydra which has a proud maritime history. He was taught how to sail at a very early age, becoming quite an avid sailor by the time he was thirteen years old. He knows the Greek islands like the back of his hands and will impress you with his in-depth knowledge of each island, the restaurants and all the interesting sites and things to do. He has a great sense of humor and he is always able to adapt to new people on board, making them feel like they have known each other for years. * Holder of Greek seamans logbook. * Holder of license for power boat up to 20m. * MCA Proficiency in Medical First Aid Aboard Ship. Sotiris is a calm, pleasant, helpful and hardworking person who has a passion for great food and who enjoys cooking mouth-watering dishes. Konstantina worked in different areas before she started sailing, and was notably a Greek dance teacher. 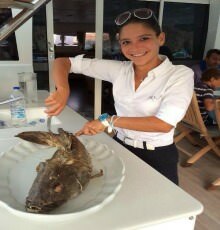 She has 3 years experience as a hostess onboard crewed yachts. Konstantina is a charming, energetic and clever young lady. Her strong empathy and attention to others help create a relaxed and well being atmosphere onboard. When it comes to setting up the table, Konstantina is an artist, who will make your meals a pleasure for the eyes as well. She speaks fluent Greek and English, and holds the Greek sailing boat licence, and the medical first aid certificate from the European Red Cross. Konstantina is also an excellent masseuse, trained in Swedish and Thai massage, and aromatherapy. 5.Rochet leaves with melon, feta cheese and balsamic vinegar vinegraite. 5.Santorinian fava with grilled octopus and fried caper leaves.